Sigma designed a floating focusing system two moving lens element groups to enhance the optical quality down to macro 1:1. Three low-dispersion glass elements were also used to try and correct chromatic aberrations. The OS letters in the name stand for “Optical Stabilization” and help you keeping you from moving when shooting in low light. 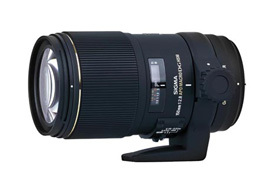 As we have not yet tested the Canon and Nikon 150mm, we will here compare the Sigma 150mm with a Canon 100mm instead. Both lenses are generally used for portrait, macro, and sports photography. Resolution: with a score of 57lp/mm, both lenses are very good. The field map for the two lenses are rigorously identical and display very good sharpness across the entire field. Both attain their best performances at f/5.6. Again, very good lenses. No noticeable problems with distorsion and transmission. Note that any real distortion would be surprising – even at an aperture of 2.8, the distortion for this type of lens is always quite low. No problems in term of chromatic aberrations. Vignetting: Very strong at f/2.8 for the Sigma and significant for the Canon for the same aperture. Technically, both lenses have both the same good and bad qualities, so users will need to find other criteria to use for choosing between them – specifically, users should refer to the manufacturers’ specifications (included in their DxOMark profiles), paying particular attention to price, weight, number of glass elements, and of course the focal length. The Sigma, at 1099USD, is twice as expensive as Canon (536USD), and it is also twice as heavy (1179g vs. Canon’s 600g). Several factors explain these differences: first of all, the Sigma lens contains 19 glass elements compared to the Canon’s 12; second, the Sigma’s mechanics are heavier, and it has a tripod stand; and third, although they are the same length (79mm), the Sigma has a much larger diameter (72mm vs. the Canon’s 58mm). Taking into consideration this analysis, our advice is – if you do not absolutely require a 150mm lens, you should opt for the Canon 100mm. You will get the same quality at a much better price, without the inconvenience of greater weight and bulkiness.